Metanet Cloud provides customized services for your enterprise ranging from consulting to deployment, operation and management. We design the full steps from cloud strategy optimized for the environment and needs of your business to cloud migration for higher cost-efficiency. We develop an optimized cloud strategy and provide an adoption roadmap. We analyze your business characteristics to migrate to the cloud reliably and efficiently. 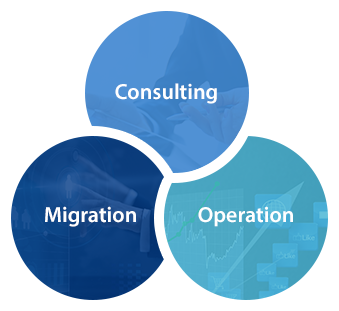 We provide customized managed services for more stable business operation. By altering the fixed costs into variable costs, we optimize cost structure to enhance business agility amid the rapid changes in the market. Building an exclusive cloud environment on an enterprise's dedicated resource pool enables flexible system design and robust security for your organization. Integrated suite, DevOps and marketplace can help you build mobile applications and internet-scale solutions more efficiently. Microsoft Azure integrated IaaS and PaaS, and provides with variety of cloud service stacks from global centers. Microsoft Azure supports diverse operating systems, programming languages, framework, tools, database and devices, and enables moving an Hyper-V Virtual Machine across data centers without converting.